As we are in the ninth inning, the home stretch, of my month of short stories we come across Alice Munro. She is the master – the best of the best. I have been voraciously reading Alice Munro for decades now… and she should be in my list of writers that I have read everything – but she writes so much (all short stories) that there is always more. Most of what she writes shows up first in the New Yorker – she is the quintessential New Yorker fictioner. What she does is magical. Read her stories and pay attention to how she plays with time. There is usually several different time planes going on – complex, yet made clear by careful attention to detail. The story is often told by illuminating subtle changes in a character between fictional scenes that take place on different sides of a shift in the story. Often times this shift is never actually shown or described… merely inferred from what has scarred or uplifted (or both) the characters before and after. There are subtle connections across time and place – you have to look closely to figure them out – but they resonate deep in your mind as you read. Today’s story, Passion, is pure Munro. A woman is looking back over a critical period of her life – how critical it was and in what way isn’t clear until the final sentence. I didn’t do this on purpose – but it is very interesting to compare this story to yesterday’s – The Garden Party. Both are tales of class differences. But Passion – the Munro story – is the opposite… a mirror image, of Mansfield’s The Garden Party. In this one, the protagonist is a poor girl that stumbles into contact with the wealthy. However, as occurs in yesterday’s tale – once in the other’s camp she is exposed to death, and is changed in complex and subtle ways. Both women (both about the same age) are smart, resourceful, and perceptive beyond their years and expectations and are relied upon to help keep things going smoothly. However, both learn that the world is a harder, more complicated, and dangerous place – with darkness, passion, and beauty all wrapped up and twined, twisted, and knotted together. The wealthy Traverse family in today’s story is not as isolated or as heartless as the Sheridans in yesterday’s – but they are every bit as flawed and are quietly doomed. Munro spells out this doom without embellishment or symbolism – she simply tells the story – with great skill. It’s perfect. It’s why she is the best. She had thought that it was touch. Mouths, tongues, skin, bodies, banging bone on bone. Inflammation. Passion. But that wasn’t what she’d been working toward at all. She had seen deeper, deeper into him than she could ever have managed if they’d gone that way. What she saw was final. As if she were at the edge of a flat dark body of water that stretched on and on. Cold, level water. Looking out at such dark, cold, level water, and knowing that it was all there was. It wasn’t the drinking that was responsible. Drinking, needing to drink—that was just some sort of distraction, like everything else, from the thing that was waiting, no matter what, all the time. This is day Twenty-nine of my Month of Short Stories – a story a day for June. Katherine Mansfield was a writer from New Zealand that spent a large portion of her short life in Europe. She lived in the years around World War I. Her upbringing was very upper class (reflected in today’s story) but left that life behind for a bohemian existence. She hung out with some of the other great writers of the time like D.H. Lawrence and Virginia Woolf. She contracted tuberculosis and after years of illness she died at 34. Today’s story is one of her later stories… and it’s one of the classics. When you first look at it what you see is a tale of class – the silly rich folks with their fancy smancy party, complete with cream puffs and a band, while down the lane the poor folks are dying. All this is true, and if it was all it would be a pretty good tale. There’s more though, lots more. It’s a coming of age tale, with a twist. The young girl, Laura that has her first exposure to death… even to life outside of her garden party world – is modelled on the myth of Persephone. She visits the world of death and returns. So, here in a simple little story, we have issues of class, of life and death, of coming of age and the loss of innocence, and even the horrors of war. This complex tapestry – the end makes sense. Laura decides to tell us what life is… and she answers the only way she can. There lay a young man, fast asleep – sleeping so soundly, so deeply, that he was far, far away from them both. Oh, so remote, so peaceful. He was dreaming. Never wake him up again. His head was sunk in the pillow, his eyes were closed; they were blind under the closed eyelids. He was given up to his dream. What did garden-parties and baskets and lace frocks matter to him? He was far from all those things. He was wonderful, beautiful. While they were laughing and while the band was playing, this marvel had come to the lane. Happy … happy … All is well, said that sleeping face. This is just as it should be. I am content. This is day Twenty-eight of my Month of Short Stories – a story a day for June. 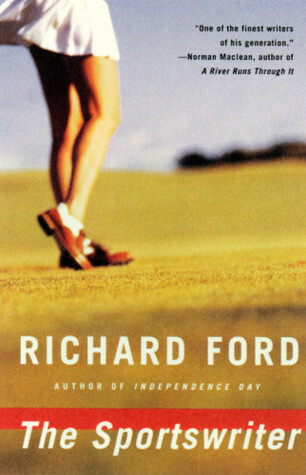 The cover of Richard Ford’s novel – The Sportswriter. One day, a while back… I remember I was at a crossroads, but I don’t remember what that was. Some sort of ridiculous existential panic. In adjusting my way of looking at the world, I decided to change what I was reading. That’s the sort of pitiful thing that I do. So I sat down with a fistful of recommended novels lists, and after a bit of seeking and thinking, I came up with The Sportswriter, by Richard Ford. I’m ashamed to admit that one reason was a strange, and probably perverse, fascination with the book’s cover. So I bought the book and its much-ballyhooed sequel – Independence Day, and read them (the third novel in the Frank Bascome trilogy, The Lay of the Land, had not been published yet) in one gulp. I wasn’t sure what to think of the books…. They were very, very well-written – but I simply couldn’t get myself to care enough about Frank Bascome. I felt sorry for him – for the loss of his child – but his drowning in angst by simply living out the life of a New Jersey family man, sans family, wasn’t interesting enough. There didn’t seem to be enough there there. Then, after a couple years, I stumbled across Richard Ford’s short stories… which were another deal altogether. More specifically, I read the collection Rock Springs. I found there was some meat on these bones. The stories in Rock Springs put Richard Ford in the category of Dirty Realism (this term was coined by Bill Buford of Granta – he said, “Dirty realism is the fiction of a new generation of American authors. They write about the belly-side of contemporary life – a deserted husband, an unwed mother, a car thief, a pickpocket, a drug addict – but they write about it with a disturbing detachment, at times verging on comedy. Understated, ironic, sometimes savage, but insistently compassionate, these stories constitute a new voice in fiction.”) – along with Raymond Carver, Tobias Wolff, Frederick Barthleme, Cormac McCarthy… and others. These are all writers I love and I was glad to find another one to read. I read more about Richard Ford’s life – which I at first assumed was an Eastern, academic upbringing – to find he was born in Jackson, Mississippi, and lived a lot of places, including New Orleans (I think a person has to spend at least some time in New Orleans or he can’t fully understand humanity). Hmmmm…. That’s odd. While I was putting this together, I discoved that the story is in two parts and I had only read the first. Give me a few minutes to finish it up and I’ll get back to you. Ok, that was interesting. I think I liked the story better with the second half missing. There is a bit of action in the second half – but the characters are wooden and, in the end, it signifies nothing, or at least nothing much. As a matter of fact, I wish I hadn’t read that second part. I think I’ll forget about it. And so, he granted himself the year for his new money to take him someplace good. He told the two nice studious girls he’d been seeing since college that he was going away and maybe wouldn’t be back so soon. They each expressed regret. One drove him to the airport and kissed him goodbye. His family made no complaint. In Paris, it was autumn, and he found a tiny, clean flat through a friend who knew a woman who did such things. It was light but noisy, so he was often out. He attended a beginners’ conversation class at the American Library, visited the American bookshop near where he rented in Rue Cassette. He read (for some reason) Thorstein Veblen and Karl Popper, but seemed to meet no one French. He declined dinner with the young business types from his class. He tried to speak, but found that if he spoke French to French men, they would answer him in English, which they wanted to practice. This is day Twenty-seven of my Month of Short Stories – a story a day for June. A teacher once told me it was possible to make a living selling books that you had paid to have printed. This was decades before ebooks and online publishing. He said you could go around with cases of books and give talks or readings at book clubs, schools, and such and sell enough to get you through the day and on to the next stop. It would be a hardscrabble hand-to-mouth life… but it could be done. I knew he was right, because I had met someone like that. Nacogdoches, Texas, is a big town… or a small city in the deep piney woods of East Texas. I was there to deliver a talk on the effects of acid rain on the calcium cycle in red spruce forests at Stephen F. Austin University. My talk was over by noon and I had a hotel room for that night paid for by the University, and I was going to use it – so I had an afternoon to kill in Downtown Nacogdoches. There wasn’t much to do, but I wandered into some place off the square that sold antiques and notions – called The Runaway Mule. There was a guy that seemed to be the owner, setting up folding chairs in a fan shape around a little worn wooden lectern. Nothing to do, I decided to help, and we chatted while we worked. I asked him about the name of his store. That story seemed pretty far-fetched to me, but I had to admit it was a good one. We finished setting up the chairs. “What’s happening now?” I asked. “Oh, the Nacogdoches Ladies Reading Society is having a meetin’.” the owner said. “Some writer I sure never heard of is coming in to try and sell some books.” He tapped a ratty looking cardboard box that had obviously been opened and re-sealed a few times, then pushed it under a folding table he had set up next to the lectern. I thought this might be worth sitting in on, so I walked down and had a burger and shake a few doors down and came back in time for the Ladies Reading Society. Sure enough, I found the seats full of Texas matriarchs, gossiping and waving their programs to try and bat away the flies and heat. Right on time, the author, Armando Vitalis appeared from the men’s room in the back of the store and took his place at the lectern. The writer was very tall and almost impossibly thin. His hair was thick, dark, long, and wild, with only a touch of gray starting to pepper his temples. He wore a light suit that was fashionable and expensive at one time but gone to shiny at the elbows and knees. He introduced himself and went into a long story of how he had decided to become a writer while working as a bookkeeper at a foundry in Cleveland. He name dropped a few popular authors and expounded on their theories of fiction that he had pried from them during various parties at New York publishing houses. At hearing these famous names and stories of the exotic big city, the level of excitement of the Ladies Reading Society became noticeably higher – their faces would flush and their waving of programs went faster and more desperate. Then Armando Vitalis did a couple of readings. First, he read an untitled short story that seemed to consist of a series of odd action-filled short scenes that seemed unconnected to each other. The women were confused, but eventually settled down in that way that folks sometimes do when they assume they are simply too uneducated and ignorant to understand what is being presented to them… but don’t want to admit it to anyone, even themselves. Then he recited a scene from his new, as-yet unpublished novel, Laid With Iron Rails. It was an embarrassingly detailed love scene between an older woman and a much younger man. You could see the Reading Society ladies squirming, uncomfortable… but riveted nonetheless. They all applauded with enthusiasm when he finished. He sat at the folding table and commenced to autograph and sell copies of paperbacks he pulled from the ratty cardboard box and stacked on the table. The Nacodoches Reading Society lined up clutching their pocketbooks, waiting excited yet patient. Everyone bought at least one book. About half left with their purchases and the rest stayed behind, clumped together and talking in low tones, maybe hoping to get another chance to meet with the author. I bought a copy of a novel, Game for His Crooked Jaw. I asked Vitalis to sign it “To Starbuck.” He glared at me, but I wanted him to know I recognized the quotes that he was using for his titles. I never read the book. It was so poorly printed and cheaply bound, that it literally fell apart before I could get around to steeling myself up to diving into the thing. The funny thing is, I did see Armando Vitalis one more time. That night, at the hotel bar, I saw him sitting at a table with the gray-haired, but remarkably well-preserved vice-president of the Nacodoches Ladies Reading Society. He seemed to be hitting a dark whiskey pretty hard while she sipped at a white wine. They were still there when I went back to my room. There doesn’t seem to be any record of Armando Vitalis on the Internet anywhere. I don’t know how long he was able to keep up his dream of writing and selling his books. The only work I could find was this strange little short story From Hell’s Heart I Stab at Thee – which was published in a shoddy online zine called Handicapped by Laziness. The zine is long gone, but the link to the story still seems to work. I’m not sure for how long. She reached a point near the end of the market and was beginning to worry that her contact would not show. She was looking at a pyramid of strange, oblong, spiked fruits, nonchalantly resting her fingertips on one of the samples. She was trying to ignore the peddler that had sliced one open with a rusty machete and was offering her a sample of dripping purple flesh that gave off a pungent sour odor and was rapidly drawing an even thicker swarm of flies. Right then the top fruit in the pile exploded in the crack of a high powered bullet, spraying her with pieces of warm, sticky pulp and sending the crowd into a panicked frenzy. This is day Twenty-six of my Month of Short Stories – a story a day for June. The first book I read by Alain Robbe-Grillet was Jealousy (La Jalousie). I’m not sure why I read it (nobody I’ve ever met has read any Robbe-Grillet) – I think I picked up the paperback from a clearance pile in a used books store. Probably, I liked the cover. It was an amazing book. Robbe-Grillet’s writing is “realist” or “phenomenological” or “a theory of pure surface.” There is no plot, no characters, no inner dialog… no nothing other than descriptions of scenes. In Jealousy there is an unseen and unheard narrator – the book is telling the reader what this person is looking at. Through repetition, geometric arrangements, repetition, details, and finally repetition – a story is built up, layer by layer. Jealousy takes place on a banana plantation where the unseen narrator is worried that his wife is having an affair with a neighbor named Frank. The reason it works so well, I think, is that the mind of the reader fills in the gaps of story, character and situation that are completely absent from the text. Your imagination is guided by the images that are transmitted… especially by small details that change from one repetition of an image to the next. The book is entirely free of emotion – yet the tension, dread, and excitement builds in the reader’s mind… the inner vision that is conjured up is so much stronger – it is personally tuned to the psyche of the reader by the subconscious – than if it was spelled out by the author. At least, that’s what I took from it. Today’s story, The Secret Room, holds true to the Robbe-Grillet style. It is a single scene, meticulously detailed, with no explanation of who, why or how. Yet, at the end, the effect is strong, the emotions are stirred – though there are plenty of loose ends left hanging… so to speak. 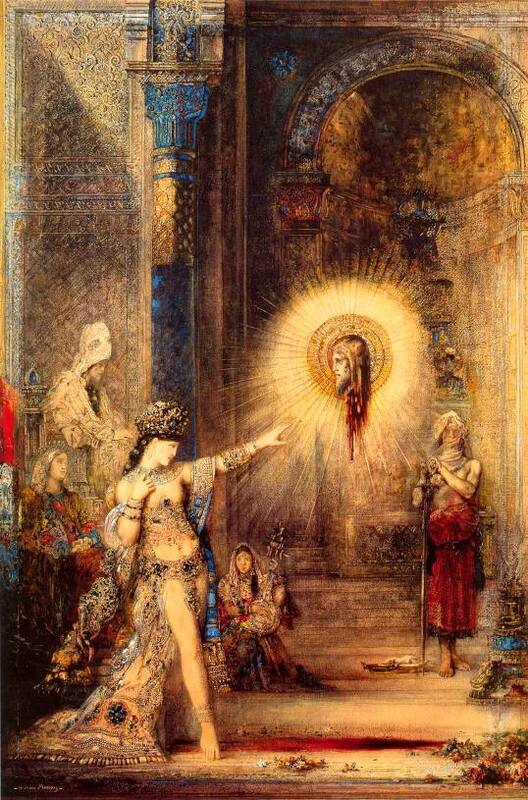 One fact that might help, is that the story was dedicated by the author to Gustave Moreau. The story certainly could be interpreted as a description of a Moreau painting. The last word in the story certainly would indicate that. But the painting moves back and forth in time. Is the story the reaction of a person looking at a painting? Is the author/writer/unknown narrator describing his own thoughts on what must have occurred? Or is he using the technique of a painting to convey the horror and contrasting the terror and violence with the beauty that still resides in the situation? Almost certainly… all the above and more. In the background, near the top of the stairway, a black silhouette is seen fleeing, a man wrapped in a long, floating cape, ascending the last steps without turning around, his deed accomplished. A thin smoke rises in twisting scrolls from a sort of incense burner placed on a high stand of ironwork with a silvery glint. Nearby lies the milkwhite body, with wide streaks of blood running from the left breast, along the flank and on the hip. This is day Twenty-five of my Month of Short Stories – a story a day for June. I have always thought of William Carlos Williams as a poet. His poem “XXII” (which most people call “The Red Wheelbarrow“) has always been a wonderful touchstone to me – such an example of the power behind a few simple words. I never knew he wrote short fiction. And I really never knew that he was a physician. A biographer said that he, “worked harder at being a writer than he did at being a physician” – apparantly he was pretty good at both. Does that illuminate today’s very short short story? Is it important that the author knows what he is writing about and in all likelihood is writing almost directly from experience? That’s a tough question. I imagine that a very talented writer could imagine what it would be like to be a doctor when confronted with a stubborn child – of course, anyone could type out the same words. But the fact that an experienced physician wrote the piece gives it an air of authority that it wouldn’t have otherwise. Is that important? Is it fair? Is Batman a Transvestite? Who knows? At first, the story seems to be a musing on the use of power. Is it appropriate to force a human being to do what they don’t want to do? I don’t think that’s the real intent here, though. First of all, it is undoubtably a matter of life and death – diptheria was an often fatal disease then – both for the child and for society in general. Of course it was appropriate for the doctor to force her to give up. The real point of the story is the doctor’s attitude. He seems to be a good man, a caring man, and is there to save the child’s life, after all. But her insubordination awakens a primitive passion in the doctor, he finds himself wanting to hurt the child. It’s a fascinating scene, especially in the hands of someone that knows, and someone with the skills with words of William Carlos Williams. This is day Twenty-four of my Month of Short Stories – a story a day for June. Nearly four years ago, WEIRD TALES published a story called “The Phoenix on the Sword,” built around a barbarian adventurer named Conan, who had become king of a country by sheer force of valor and brute strength. The author of that story was Robert E. Howard, who was already a favorite with the readers of this magazine for his stories of Solomon Kane, the dour English Puritan and redresser of wrongs. The stories about Conan were speedily acclaimed by our readers, and the barbarian’s weird adventures became immensely popular. The story presented herewith is one of the most powerful and eery weird tales yet written about Conan. We commend this story to you, for we know you will enjoy it through and through. A dozen years ago, in February of 2001, I had just finished up a solo camping trip to Big Bend way out in far west Texas. I had a long drive back to the Metroplex, one I had made before. This time, however, I had picked a different route back, one that was slightly longer than usual. Instead of going north to Interstate 20 and taking it back, I caught 67 through San Angelo and on to Brownwood, then north to the little hamlet of Cross Plains. Once I made it to that small town, I followed a little map that I had scribbled to a tiny house on the west side of town. I stopped, looked at the nondescript wood frame dwelling for a minute, then went back to my car and drove the rest of the way home. I had wanted to see that house because of the person that lived in it in the 1930s – it was the childhood home, and the place he committed suicide, of Robert E Howard. Even though it looked exactly like a million other old farmhouses all across the Great Plains – I wanted to see this one… to see it, and nothing more. Like anyone that has been a voracious reader for almost half a century now, I have read my fair share of pulp. Mostly devoured in the form of cheap paperback reprints, I was familiar with Conan, and with Robert E Howard… along with the other writers of depression-era fantastic, gothic, and strange tales – plus their imitators that have continued the tradition still. But the specific incident that lead me to my stop in Cross Plains had occurred on a cult movie night at the Dallas Museum of Art. I had seen that they were showing a film I had never seen before – The Whole Wide World – an elegiac story of Robert E Howard (played by Vincent D’Onofrio) and his relationship with a girl named Novalyne Price (Renée Zellweger, in one of her first roles). It was an amazing film and one that almost nobody had seen. It was so representative of the writing life, the desire for creativity and expression, the sad doomed love story, and the insane dreamer pounding out madness for pennies a word. Even the evocation of rural Texas in the depression felt true and fascinating. The representative from the distribution company came out and thanked everyone for seeing it – he said, “We are so proud of this movie and want as many folks as possible to see the film.” Now it’s more available… you should take a look. I found out that it was based on a memoir by Novalene Price – called One Who Walked Alone – which hadn’t sold many copies. I ordered it from Amazon and (though it really wasn’t particularly well-written) enjoyed it thoroughly. So here’s a pulp novella from Robert E Howard, Red Nails. Don’t think of Arnold and his movie when you read it… think of the doomed crazy boy hammering away in the back of that little farm house in that little town in Texas… fighting back his demons the only way he can – with a typewriter.